Our members have made Signal what it is for the last 71 years, and to show our gratitude we’re throwing a week-long party! Enjoy a mini carnival at our branches — play games, snack on food, and win prizes. All are welcome, so bring the entire family! Visit any or all of our branches the week of October 15-19 to enter our sweepstakes. You may also enter online by sharing what you appreciate most and submitting the entry form. First prize winner will receive a vacation package for two to the destination of their choosing. * Visit libertytravel.com to explore destinations. Third prize winner will receive an Amazon Echo with Alexa. We’re looking forward to celebrating together! * No purchase is necessary to enter, and a purchase will not improve your chances of winning. Signal Financial FCU employees, officials, and their family members are not eligible to enter. Entrant must be a legal resident of the U.S. and 18 years of age or older. Membership at Signal Financial Federal Credit Union is required for sweepstakes entry. Only one entry per person. To enter contest you must fill out this form and submit it to a Signal Financial FCU representative between October 15th and October 19th, 2018 or via a Signal Financial FCU social media page. Sweepstakes entry begins 10/15/18 9:00 am EST and ends 10/19/18 at 6:00 pm EST. Winner will be chosen by a random drawing at the Signal Financial FCU headquarters on 10/26/2018. Three winners will be chosen; one prize per winner. 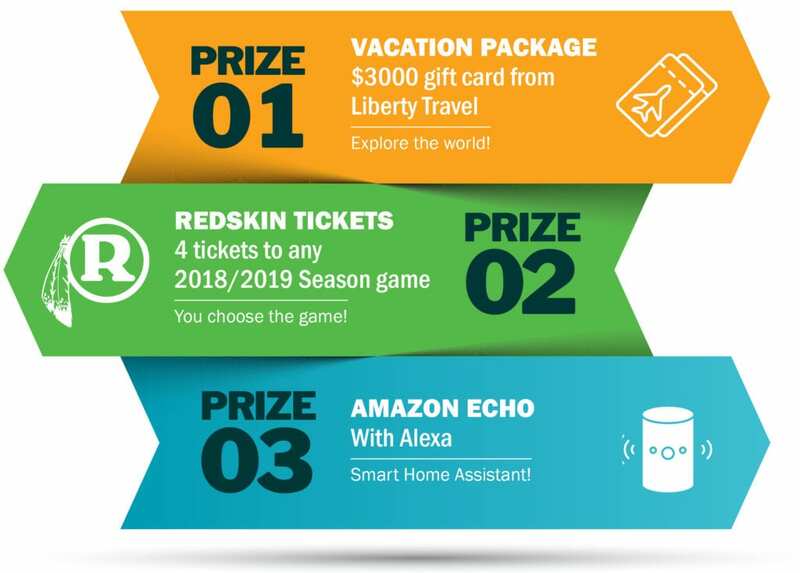 Prizes are: a vacation package from Liberty Travel (valued at $3,000), four tickets to a Redskins 2018/2019 season game (up to a value of $650), and an Amazon Echo with Alexa (valued at $100). Prizes are not transferable or assignable. All applicable federal, state, and local taxes (excluding sales tax) are the winner’s responsibility. Acceptance of prize constitutes permission to use winner’s name and likeness for publicity purposes and without additional compensation (winner will be required to sign a separate advertising consent form). Void where prohibited. All federal, state, and local laws apply. For winner information, call 301-933-9100 ext. 334. Amount in U.S. dollars. Odds of winning are dependent on the number of entries received.